It is an artificial nutrition provided to the body via intravenous route. It is also known as total parenteral nutrition TPN. These artificial nutrients and food supplements are provided to the patients who are not able to eat anything or paralyzed or unconscious. 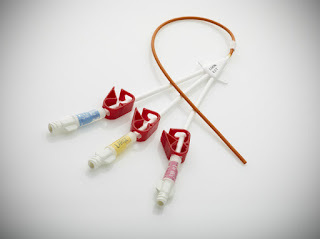 IV lines or tubes are used to inject the total parenteral nutrition. TPN is required to fulfil the nutrient requirements in the patient’s body. The composition of the total parenteral nutrition is based on the patient’s requirement as its preparation is based on the body mass index of patient. Hyper alimentation may also be required to cure the serious eating disorder. There are many complications associated with the administration, catheter insertion or metabolic process like refeeding syndrome. Other complications are pneumothorax, sepsis occur due to the catheter. There is a greater risk of infections occurring during hyper alimentation administration. The arteries may get puncture during injecting the total parenteral nutrition. The other complications than these are related to the preparation of hyper alimentation. The hyper alimentation is prepared on the basis of patient’s body mass index, so it is found very complicated and difficult to adjust it according to the patient’s need. Hyper alimentation is used in various conditions in which the excessive loss of body nutrients occur like jaundice and severe vomiting. The hyper alimentation is of 3 types i.e. intravenous hyper alimentation, parenteral hyper alimentation and enteral hyper alimentation. It consist of nutrients like electrolytes, vitamins and amino acids. It is also known as hyper tonic solution. According to its need, it is administrated intermittently, throughout the day or overnight. Hyper alimentation is recommended in obstruction, Crohn’s disease, central nervous system disorder, and malabsorption and bowel syndrome. The motility disorders in which the nutritional loss occur also require hyper alimentation. The hyper alimentation solution is also known as hypertonic solution and it is made up of many components which include carbohydrates, amino acids, vitamins (essential and non-essential) and electrolytes. Along with these components, some other components are also present according to the patient’s body demand and these components are minerals, glucose and fats. The concentration of these above mentioned components totally depends upon the patient’s body mass index because the body mass define the nutrients deficiency in the body. The hyper alimentation is every time prepared freshly according to the patient’s need. Hyper alimentation syndrome is also known as fatal hyper alimentation syndrome or over nutrition. It is a malnutrition in which the concentration of the nutrients exceeds from the normal value in human body. Due to the excessive intake of hyper alimentation, the mortality rate increases. The excessive use is fatal for life. As the hyper alimentation may lead to obesity. Due to the repetitive intake of hyper alimentation solution, the vitamin poisoning may occur and iron poisoning occur as a result of excessive minerals intake. The excessive intake of the hyper alimentation solution may also lead to increased food consumption.